Can Cau market is one of the most fascinating open-air markets in the region, specializing in livestock. It’s 20km North of Bac Ha and just 9km south of the Chinese border. 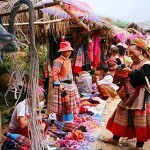 Visitors are generally H’mong groups from highland villages. 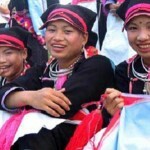 The local H’mong are the famous variegated or Flower H’mong due to the intricate and colorful nature of their costumes, and their colorful dresses makes is a beautiful sight. Almost every Saturday around 8 different minorities are represented at the market. Travel is often made by horseback as a way of carrying the heavy loads to and from market. Can Cau also attracts a large number of Chinese traders, evidenced by the booming dog trade here. 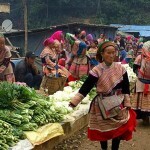 Coc Ly Market Sapa It is the colorful market in a mountainous area where the Flower H'mong mainly gathers to exchange their homemade products. Xin Cheng Market Sapa Xin Cheng market opens on every Wednesdays. 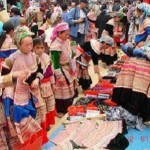 It offers the opportunity to discover a colorful gathering point of many local minorities (Flower Hmong, Tay or Giay).